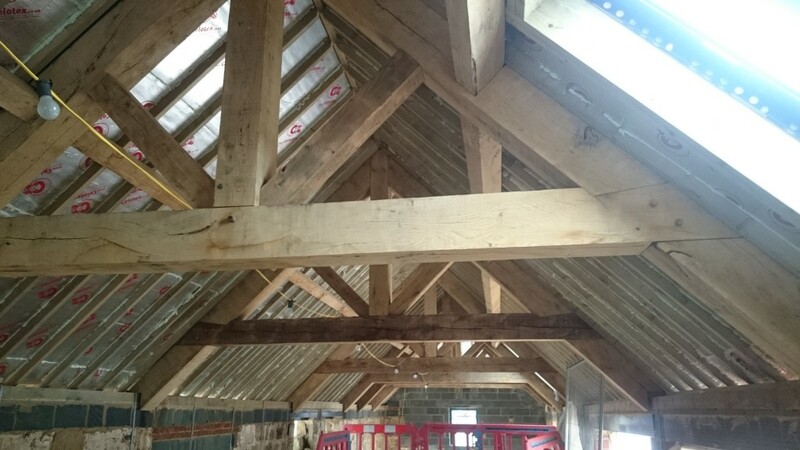 Here at Traditional Oak and Timber Co we construct oak frames and oak trusses and carry out framing in many sizes and dimensions. We are also able to make oak trusses to order in a kit form or supply as a whole truss. 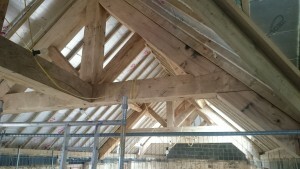 We were asked to design and supply the materials for a set of large trusses going into a very large barn conversion. The trusses were structural but also needed to be able to be high enough for the upstairs to have enough head room. If the main tie beam had been at the bottom of the rafters this wouldn’t have left enough room, so we had to go with a raised collar, or raised tie truss. The collar of the truss or the Tie (horizontal beam) is raised up the principal rafters and enlarged to give it enough strength to stop the rafters pushing out on themselves or the wall the trusses sit on. 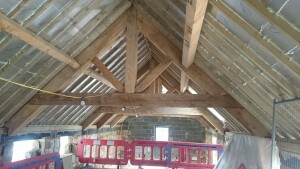 We supplied air dried oak beams with large 250 x 250 sections size to give the trusses the strength to support. You can see in the photo above the large dove tail joint in the collar to act as a wedge and stop and horizontal pulling forces on the truss with the weight of the roof. With the trusses finished and installed we think you will agree they look fantastic!